Highly anticipated: Information on Intel’s 9th-generation processors has been leaking online since last November, but the chips finally look set to launch sometime over the coming weeks. The flagship Core i9-9900K is the processor most people are excited about, and if its performance benchmarks in 3DMark are to be believed, the hype is justified. While the database entry lists the processor as “not being recognized,” the specs suggest this is the Core i9-9900K: 8 cores, 16 threads, and a Turbo clock of 5GHz. It’s also expected to come with 16 MB of L3 cache, a TDP of 95W, and an Intel UHD 620 graphics chip. 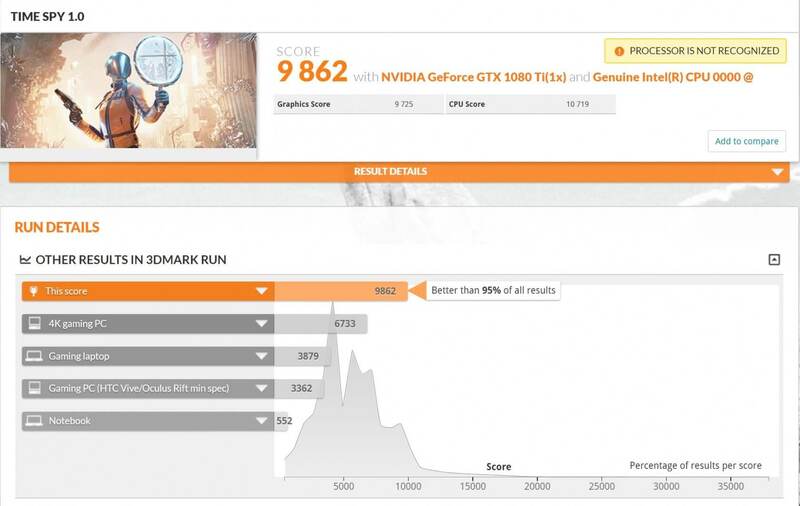 In 3DMark's Time Spy test, the CPU scores 10719 and 9862 overall. It achieved this using an Asus ROG Strix Z370-F Strix Gaming motherboard with 16GB of G.Skill DDR4-2666 memory, a 500GB Samsung 960 Evo SSD, and a GeForce GTX 1080 Ti graphics card. This does suggest the 8-core/16-thread chip is compatible with Z370 mobos—probably through a BIOS update—as well as the upcoming Z390 chipset, which might end up being a rebranded Z370. Compared to the Ryzen 7 2700X (overclocked to 5GHz), the 9900K is way ahead of the AMD chip's score of 9387 points. Intel's own 6-core/12-thread i7 8700K is also lagging behind with 8935. 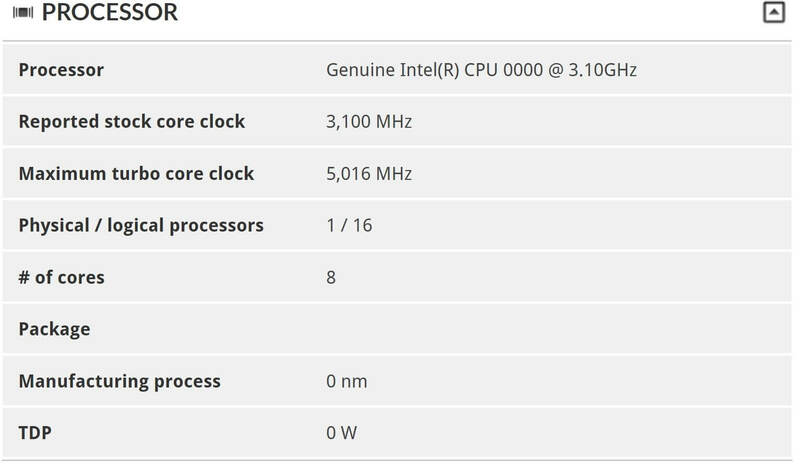 One thing that must be noted: the specs list the Core i9-9900K as having a base clock of 3.1GHz, which is a lot lower than the previously reported 3.6GHz. The most likely reason is that this is an engineering sample not representative of the final model, but it could also mean previous rumors were wrong, or the software couldn’t accurately detect the CPU’s speed. Alternatively, it might not actually be a Core i9-9900K, so a slight dose of salt could be in order. Last week brought more news regarding the 9th-gen Intel chips. 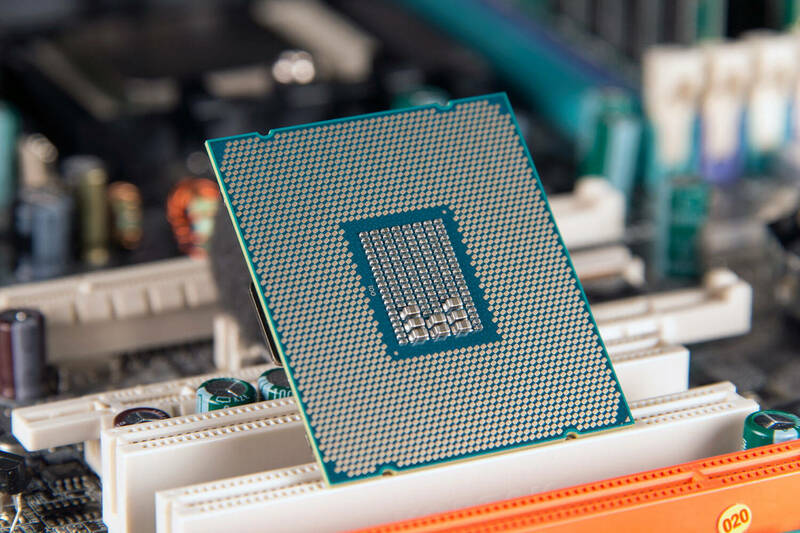 It’s rumored that the Core-i9 series will be the only ones in the new lineup to feature Hyperthreading. German site Goldem.de, meanwhile, claims that both the Core i9-9900K and Core i7-9700K will be using a soldered IHS, with the rest of the chips featuring a TIM solution.